Nvidia's Turing architecture officially went mobile back at CES in January, and that means laptop manufacturers are scurrying to bring updated units to market armed with the latest RTX graphics chips. It is viewed as one of the year's big opportunities for sales of premium systems, and though features such as real-time ray tracing and DLSS have yet to take the gaming world by storm, enthusiasts will naturally see RTX laptops as the next logical step. All the big names are keen to get in on the action, and Gigabyte is quick off the mark with five updated variants of its award-winning Aero 15. Prices start at £2,399 for the 'entry-level' X9 model outfitted with a Core i7-8750H processor, RTX 2070 Max-Q graphics and a full-HD 144Hz display. At the other end of the scale, an extreme Y9 model packs a Core i9-8950HK, 64GB of memory, RTX 2080 Max-Q and a 4K panel for a whopping £4,499. These are powerful toys for those with deep wallets, and we've been able to spend some quality time with a middle-of-the-pack SKU priced at £3,299. A serious chunk of change, and though the asking fee is the other side of three grand, you still only get second-rung graphics in the form of a GeForce RTX 2070 Max-Q. Then again, did we really expect a laptop with a Core i9 processor and GeForce RTX graphics to be affordable? The cost of high-end PC gaming is only going up. 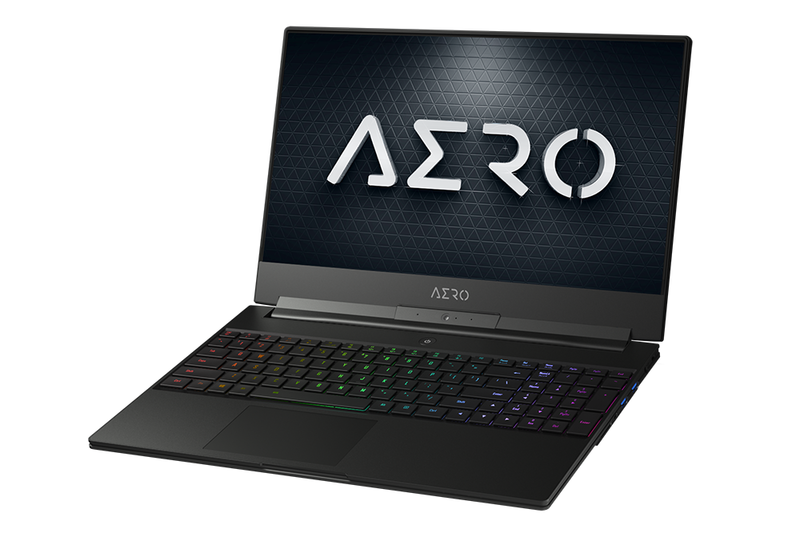 At first glance, it's hard to tell the Aero 15 X9 apart from last year's model. 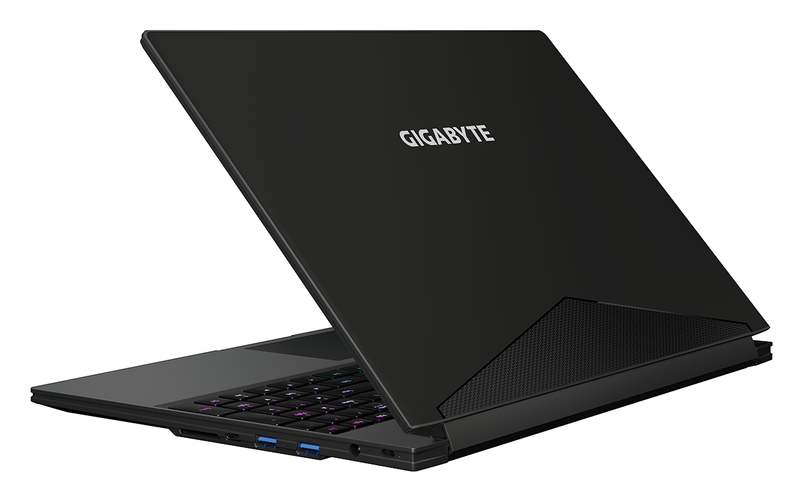 Gigabyte is continuing to use the same 356mm x 250mm x 18.9mm chassis, and that's no bad thing, as when it comes to gaming laptops, Aero 15 is one of the sleekest offerings around. Indeed, save for the RGB keyboard, you wouldn't associate this system with gaming, going by looks alone, and that means you don't need to be shy about using it in front of other people. It's a tidy piece of kit, and considering the amount of firepower under the hood, it weighs a reasonably portable 2.1kg. This is in our estimation how a modern gaming laptop ought to look, however there are a few limitations that have carried over from the previous generation. Gigabyte still doesn't offer the option of a touchscreen, which can be frustrating for users who've become accustomed to reaching out to navigate, and as for the webcam position below the screen? Yep, it's still terrible. We had complained about a wobbly display hinge on prior models, and though Gigabyte isn't officially confirming any structural changes, the mechanism does appear to be noticeably more solid on our review sample this time around. This is for the most part a tried-and-trusted enclosure, and it's on the inside that changes are afoot. Driving the system is a six-core, 12-thread Core i9-8950HK processor capable of speeds of up to 4.8GHz. Joining the CPU is a generous 32GB (2x16GB) of DDR4 memory, a spacious 1TB M.2 SSD and, of course, the RTX 2070 Max-Q GPU. 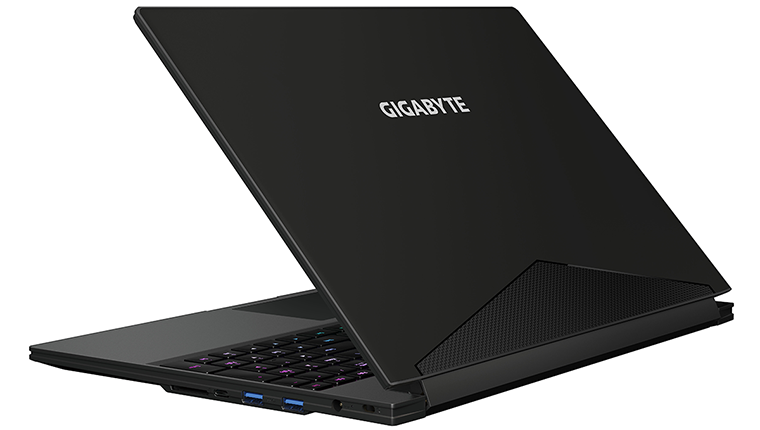 As before, Gigabyte is positioning the Aero 15 as a capable all-rounder for prosumers that like to game, and as a result the laptop eschews gamer-centric features such as G-Sync in favour of Nvidia Optimus, whereby the laptop reverts to the Intel UHD 630 IGP to save power and prolong battery life during everyday tasks. The addition of GeForce RTX graphics is of course the major talking point, and Nvidia's mobile RTX 2070 has plenty in common with its desktop equivalent. The laptop part retains 2,304 shaders, 144 texture units, 64 ROPs and a 256-bit bus hooked-up to 8GB of GDDR6 memory. How do you squeeze such a potent GPU into a thin gaming laptop? The answer, of course, is to lower clock speeds. Whereas the desktop part is granted a boost clock of 1,620MHz, the mobile equivalent drops to 1,440MHz while the Max-Q variant, for thinner laptops such as the Aero 15, falls even further to 1,185MHz. That's nearly a 30 per cent reduction in peak frequency, and RTX 2070 Max-Q also sees memory speed dialled down from 14Gbps to 12Gbps, so we're intrigued to see how it fares in our gaming tests. 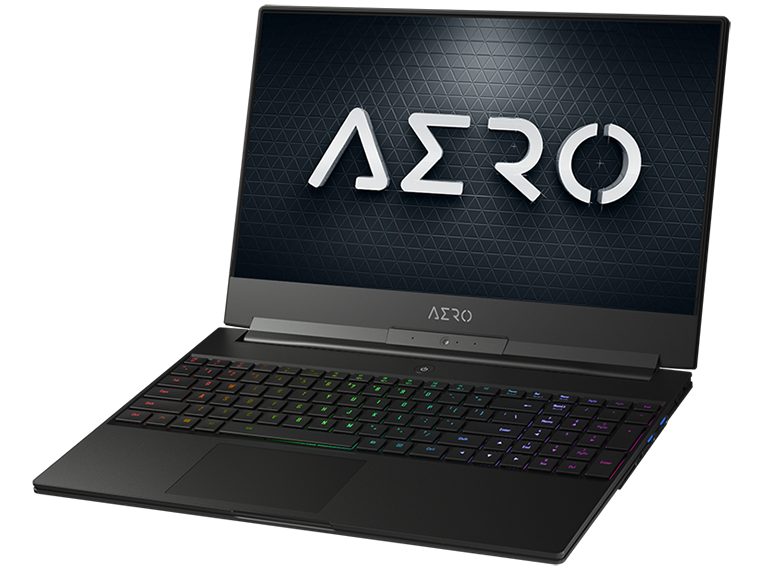 Elsewhere, it's the Aero 15 as we know it. That means a decent backlit keyboard, a spacious but somewhat jittery precision trackpad, surprisingly powerful stereo speakers, and the same 4K60 IPS panel that has featured in Gigabyte's premium machines for a number of years. Connectivity options also feel familiar. These include Gigabit Ethernet, USB 3.1 Gen 2, HDMI 2.0, DisplayPort 1.4/USB Type-C and an audio jack on the left side, while over on the right you'll find an SD card reader, USB 3.1 Type-C with support for Thunderbolt, two USB 3.0 ports, as well as a connector for the external 230W PSU. One frequent complaint of gaming laptops is that they need to be cleaner in presentation. Gigabyte has taken our feedback on board in a couple of different ways. Firstly, most of the stickers that tend to plaster the firm's laptops have been merged into one large sticker that encompasses a number of brands. It still looks tacky, but it's a whole lot easier to remove. Similarly, the software setup shows signs of improvement in key areas. 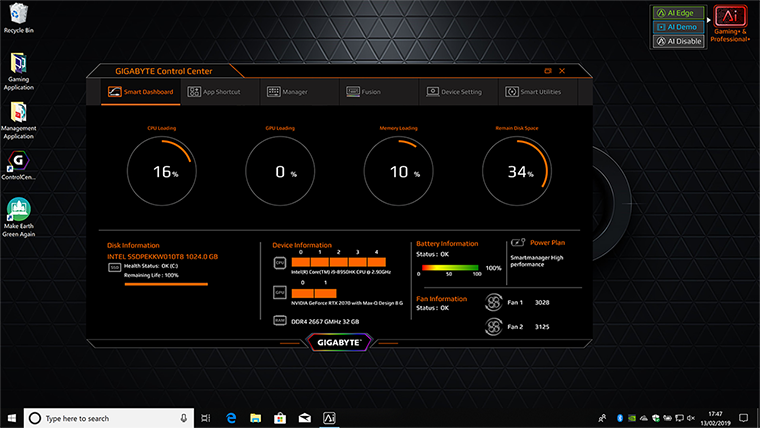 The desktop looks relatively clean, there's no nagging third-party security software, and Gigabyte has rolled many of its various utilities into a new-and-improved Control Center that now serves as a one-stop shop for RGB lighting, device settings and software updates. The big change is that curious 'Ai' icon sat in the top-right corner of the desktop. Powered by Microsoft Azure, it represents Gigabyte's attempt to maximise performance by using machine learning to dynamically distribute power to CPU and GPU depending on workload. We're told "it is also capable of optimizing System Fan/Keyboard/Sound to reduce the heat and noise," and there are two modes to choose from: 'AI Edge,' which uses locally-stored data to make decisions, and 'AI Cloud,' which uses the web to share data and determine what settings work best. Gigabyte reckons users can expect up to a five per cent performance improvement with AI turned on, but we've struggled to replicate any meaningful improvement during our own tests. What's more, in order to use the AI feature, owners need to allow Gigabyte to collect usage data. Are many enthusiasts likely to opt in? We're not so sure, but if you're inclined to keep things more private, the AI tech can easily be disabled. Enough of the pre-amble, let's get to those benchmarks and see what RTX 2070 Max-Q can do.